We’d love your help. Let us know what’s wrong with this preview of Chance Encounters by Janna Graber. Travel never goes quite like we expect. Planes are late, maps are misread and unexpected detours are made. When this happens, the twisting roads of travel can lead to adventures we never imagined — and lessons we never expected to learn. Sometimes, if we’re lucky, we cross paths with people who show us life from a different angle or provide kindness when it’s needed most. Travel never goes quite like we expect. Planes are late, maps are misread and unexpected detours are made. When this happens, the twisting roads of travel can lead to adventures we never imagined — and lessons we never expected to learn. Sometimes, if we’re lucky, we cross paths with people who show us life from a different angle or provide kindness when it’s needed most. Those we meet while traveling can change our journey, our experiences or even our lives. 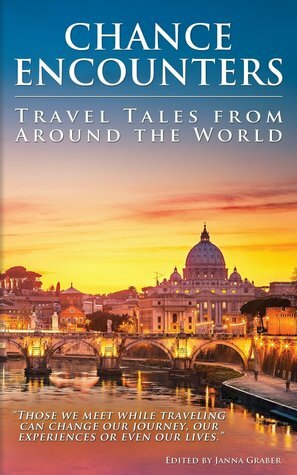 Come along with some of the world’s top travel writers as they share their stories from around the globe. Sometimes on the road of travel, we cross paths with unforgettable and extraordinary people. Here are 23 true stories of travel encounters that will long be remembered. To ask other readers questions about Chance Encounters, please sign up. how can i read the books i wish to read?where? Fun, light-hearted, wanderlust-sparking stories! This book got me psyched up for Hawaii. I just like to start off by saying that I love this book, for so many reasons. The first thing I loved that it was all short stories with an amazing meaning behind each one, and they always left me thinking! Another thing I loved about the story was how it made me gain a deeper understanding, what traveling was like at certain peridos in time.In each short stroy I got close with the main character and who they met along the way. I'd have to say my favorite story was the story from Guatemala. I f I just like to start off by saying that I love this book, for so many reasons. The first thing I loved that it was all short stories with an amazing meaning behind each one, and they always left me thinking! Another thing I loved about the story was how it made me gain a deeper understanding, what traveling was like at certain peridos in time.In each short stroy I got close with the main character and who they met along the way. I'd have to say my favorite story was the story from Guatemala. I felt like I had the connection between the two main characters. They way autor allowed you to feel, one with the story is indescribable. I think this book is great for anyone with an open idea for other cultures. Each short story take place in a different time or place, around the world. Another thing I really like about the like about it is a mix, of all different travelers. If the same person talks about the experiences they had, they most likely will do the same things in different parts of the world. When you mix different authors though, than you have a bunch of different people, with different ideas, and different views, talking about there life experiences. That is how you make a true amazing book. Once again this would be an amazing book for anyone with an open mind, and willing to learn things about the world. This is a great collection of stories from some really talented writers. This book shows how amazing other people can be, and how experiences with them can change our lives. It's very well edited and all the stories are unique. If you're looking for the next travel book to get your hands on, this is definitely a good choice. It's entertaining to read about amazing places, but especially so when those stories have amazing people of just as much importance. It's a treat to read stories that strongl This is a great collection of stories from some really talented writers. This book shows how amazing other people can be, and how experiences with them can change our lives. It's very well edited and all the stories are unique. If you're looking for the next travel book to get your hands on, this is definitely a good choice. It's entertaining to read about amazing places, but especially so when those stories have amazing people of just as much importance. It's a treat to read stories that strongly impacted the writers lives. There is so much to offer in this book. At age 19, Janna Graber packed up her bags and moved from the American West to Vienna, Austria to study abroad -- and she's been writing about interesting people, cultures and destinations ever since. Today she is a Colorado-based author, editor and producer. She has written for more than 40 publications, including national publications like Parade, Outside, Redbook, Reader’s Digest, and many othe At age 19, Janna Graber packed up her bags and moved from the American West to Vienna, Austria to study abroad -- and she's been writing about interesting people, cultures and destinations ever since. Today she is a Colorado-based author, editor and producer. She has written for more than 40 publications, including national publications like Parade, Outside, Redbook, Reader’s Digest, and many others. She has a special love for travel journalism, and has produced travel content for print, online, video and TV. She has worked in more than 38 countries — and counting. She is the author of two travel anthology books: Chance Encounters: Travel Tales from Around the World (World Traveler Press) and Adventures of a Lifetime (World Traveler Press).